2000 Sea Ray 240 Sundancer, The cockpit on the 240 Sundancer offers plenty of room to move around or relax while underway. The double bench seats offer easily fold down to create one large sun pad, which is perfect for a lazy afternoon. Down below, the 240 has a V-berth with a removable table which can easily be converted into a double berth for overnighting. The galley comes complete with dual voltage refrigerator, sink, single burner stove top and storage space. Just behind the galley is the mid-stateroom that features a double bunk and privacy curtain, which is perfect for kids or another couple spending the night.HAS NEW MANIFOLDS AND RISERS. GOOD UPHOLSTERY! A Trailer is Included! The 240 Sundancer is a grand first step into Sea Ray's world-renowned family of raised helm, mid-cabin stateroom designed cruisers. The ingenious cabin layout encompasses plentiful storage, gorgeous cherry wood cabinetry and sleeping for four. Outside, the functional cockpit is designed for versatility and entertainment for fun while docked or underway. At first glace she may appear as a large-scale cruiser, but she's still trailerable with an 8' 6" beam. 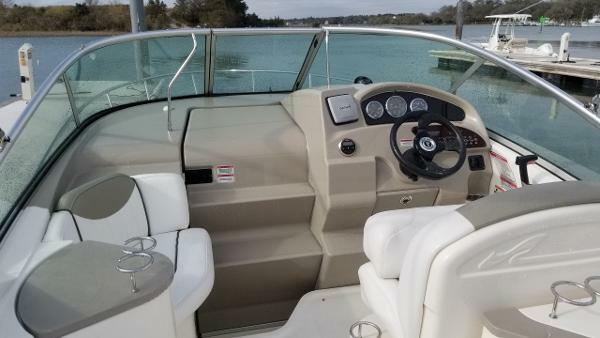 Highlights: Fresh bottom job and detail--This boat looks great! 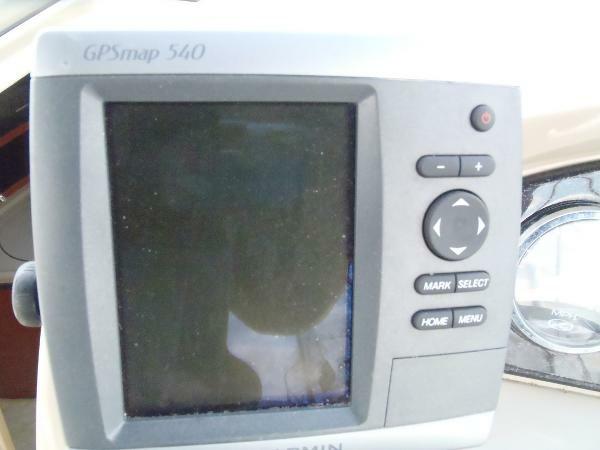 Air conditioning/Heat Camper Package Cockpit Cover Pumpout Head Stove Cockpit Table Garmin GPS This boat is listed with MarineMax on brokerage. The stock number is 156731. Please call for more details. If you are hunt an 240 Sundancer you owe it to yourself to see this one. 2008 SeaRay 240 Sundancer & Trailer Trailable SeaRay Sundancer 240 cruiser that has been exceptionally well-maintained. Powered by the MerCruiser 5.0L MPI Bravo III with only 225 original hours. 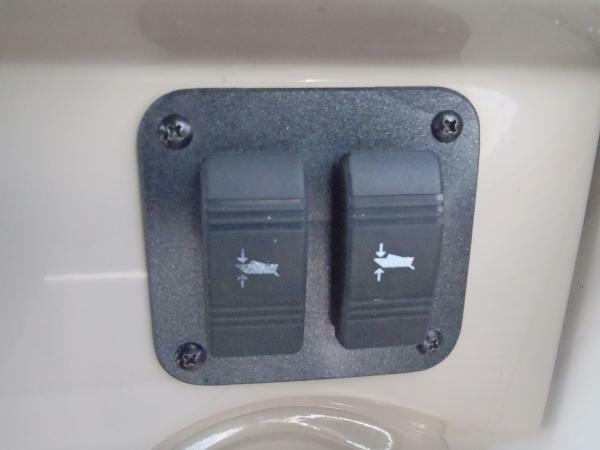 It includes a 2018 Road King aluminum tandem boat trailer with brakes and guides, double bimini tops, complete camper package with all curtains and a new heavy-duty all-weather Sunbrella boat cover. 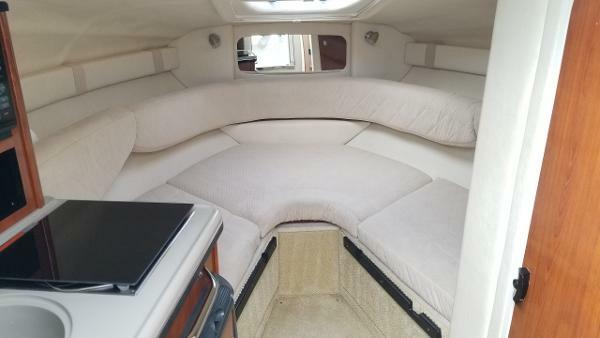 The cockpit provides plenty of seating, including a unique set of port side companion seats with drink holders and a long transom bench with removable table. 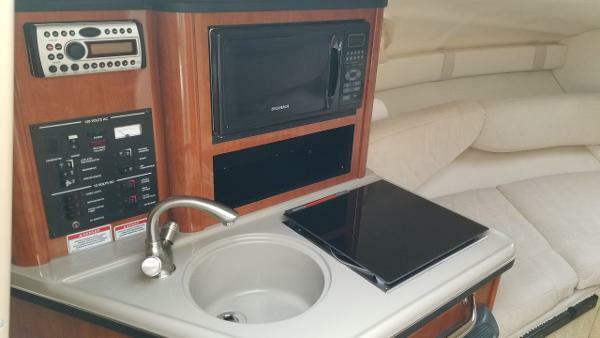 The cockpit also features a wet bar sink and plenty of storage in a large transom space. Below deck, the cabin layout has plentiful storage, beautiful cherry wood cabinetry and plenty of space for relaxing and sleeping. To port, her galley features a covered sink, single burner stovetop, standard microwave, and dual voltage refrigerator. The forward V-berth dinette quickly converts to a double berth, with dedicated stowage space for the table beneath the fore cushion. This cabin is adequate for weekending – or longer. She has a comfortable aft cabin double berth for sleeping two additional people, and a private bathroom with stainless steel sink, shower, and toilet with pump out. At the helm, she has a double wide seat with flip up bolster. Instrumentation includes: Helm Remote (for Clarion Stereo in Cabin) Trim Tabs Compass Engine Room Extinguishing System Additional features include: Shore power A/C Two brand new blue top Optima batteries Cockpit Snap Down Carpeting Full cabin enclosure Ski Tow Ring Battery Switch Shore Power standard 110V-30 amp connection & cord Telescoping Swim Ladder And many other features A great boat for spending time on the water - come and see her! 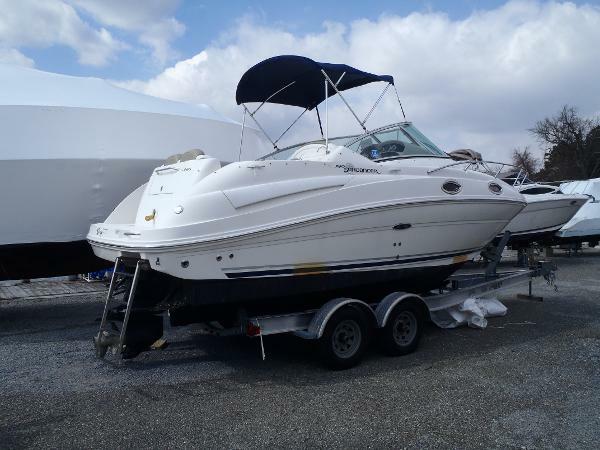 If you have any questions, please call 540-220-6723.
come see this very well maintained sea ray 240 Sundancer Trailer available. New listing photos and and full specs coming soon.